Use this buffer to smooth the body, from rough elbows and dry shins to the backs of your arms. Its alluring scent of Soap & Glory's signature Original Pink™ Fragrance - combines fresh bergamot, mandarin, rose, jasmine, peach, strawberry, and soft musk & amber base note. Wet down in the shower, turn the water off, squeeze out a handful of THE SCRUB OF YOUR LIFE™, and get a smooth on. Scrub and soap up until you're satisfied, then rinse thoroughly. This is a very gentle scrub but leaves my skin very soft and hydrated. It smells amazing and a little goes a long way. My best friend recommended this product to me, so naturally, I had to try it. I have sensitive skin and have been sensitive to body washes and bubble baths in the past, so I was a bit wary. But I was pleasantly surprised! I use the Scrub with a loofah, but you could just use it with your hands. 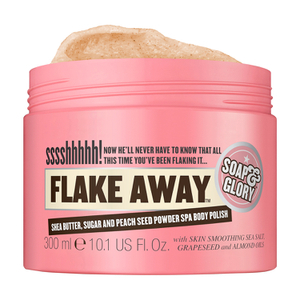 It has that distinctive Soap and Glory scent-fresh and clean with a hint of citrus and mint- that leaves skin smelling great. The cute, pink microbeads gently exfoliate, leaving skin instantly feeling tingly and amazingly smooth and soft. You notice an immediate difference in the texture of your skin as soon as you step out of the shower, and your skin will feel the same way the next day. It's now a staple in my shower routine, and my mom loves it now, too. I bought it the first time around, so the next one's on her! This is by far my new favorite product! It is smooth (great in an exfoliator) yet effective. As you use it you feel smoother, cleaner newer. Is it too much to say it is exhilarating? Wonderful? Rejuvenating? My mom likes it too (next time- she's buying). I am actually tingling all over. Try it: Worth it!